If you’re looking for a destination that combines education, fun and fellowship, then you’ve come to the right place. 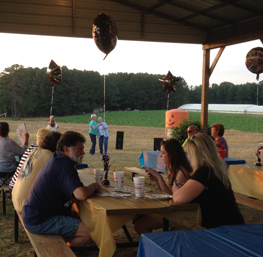 Gross Farms is well equipped to accommodate your group, whether it’s a class from school, a scout troop, church, military or civic group, a corporate staff or a family celebrating a birthday! If you are interested in booking a School Field Trip, click here! Weekday hours are reserved for Group Reservations by appointment only for School Field Trips and Company Groups. Sorry, no walk ups are permitted. NO EXCEPTIONS! Church youth groups, scout troops, 4-H groups and the entire family can enjoy healthy competition in a spirit of fellowship and respect when spending time down on the farm! It's an excellent destination for a birthday party too! There’s something for every age to enjoy. Larger groups often split into smaller teams to complete the maze in the shortest time. Mom and Dad can catch up with the grandparents while the kids work their way through the maze and the entire group can enjoy a hayride in the late afternoon! Be sure to bring your picnic basket. Outside food is permitted. Alcohol, however, is strictly prohibited. For Groups > 200 — Call! 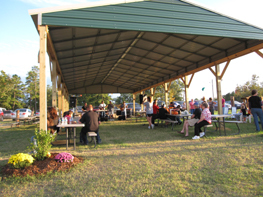 The Facility Use Fee includes admission to the open/picnic area for each person in the group, but does not include any activities. Activity tickets must be purchased separtately. All fees are due upon arrival and can be paid with cash, credit card (Visa, MasterCard or Discover) or check payable to Gross Farms Corn Maze & Pumpkin Patch. Groups of 20 or more paying customers with reservations on Saturday or Sunday and who arrive at the farm prior to 5 PM receive $2.00 off the individual (a la carte) maze admission price. Discount does not apply to the Combo Ticket price. Normal hayride and other activity rates apply. No other discounts or coupons are allowed. * We will begin accepting reservations for our 2018 Season on August 20. Confirmations will be sent to the contact person listed within 3 business days. Groups are not considered registered until a confirmation notice is received from Gross Farms. Interested in getting away from the office and doing some teambuilding? The Corn Maze provides an excellent venue for corporate groups to foster camaraderie and build team spirit in a fun and relaxing atmosphere. A number of local caterers offer menus with appetizing selections. Give us a call to find out how we can customize an experience sure to please even the toughest of bosses! If it is necessary to cancel your reservation, please contact us by email (reservations@grossfarms.com or 919-498-6727) as soon as possible, but no less than one week prior to your scheduled reservation. 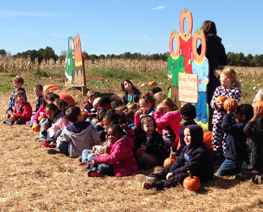 Because all activities are located outside and are uncovered, Gross Farms Corn Maze & Pumpkin Patch will close as a result of heavy rain or storms. If your reservation needs to be cancelled due to inclement weather, we will make every effort to reschedule your group as space permits. If you are uncertain about weather conditions at the farm or need to reschedule your group due to inclement weather, please send an email to reservations@grossfarms.com or call (919-498-6727) as soon as possible.